Niche ranks cities using a complex grading criteria when looking at crime, public transportation, nightlife, recreational facilities, quality of life, and other aspects that make a neighborhood a fun and exciting community. 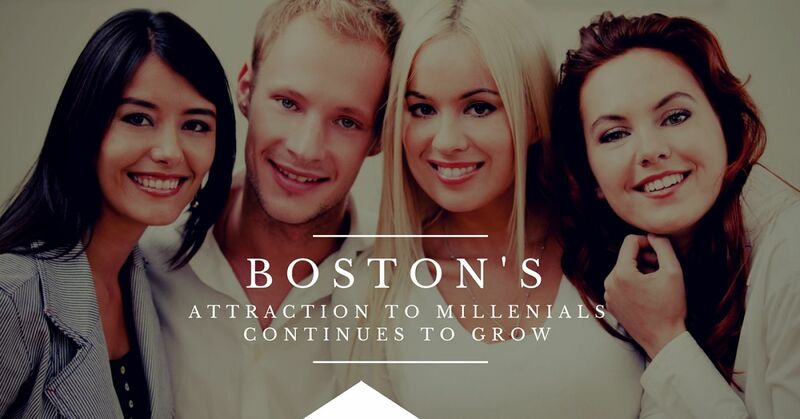 Boston is number eight on this list for cities in the country that are attracting millennials says Biz Journals. If you have been on the Boston home search, you will recognize the extremely high demand for properties in and around Boston. Here are some of the reasons for Boson's popularity with Millenials. The Boston real estate market is strong for 2018. Boston MA gives residents the chance to live in a variety of diverse areas all known for as top entertainment and cultural zones. There are fine dining establishments, museums, historical sites, shops, and sporting facilities to tour or visit when living in and around the city center. All of these areas get an A+ rating from Niche making Boston MA an extremely attractive place for couples, families, and individuals to live. The extremely high demand for housing in Boston has is generating new real estate activity in the surrounding areas too. From Caste Island in South Boston to the beaches of Cohassett, the greater Boston area has something for everyone. The Boston Opera House is an iconic venue in the city because of the vaudeville design that is one of the few remaining examples of the period. Shear Madness puts on a play that morphs into a new comedy every season for almost 40 years. Did you know that the Lyric Stage has dozens of awards dating back to the 1990's? The most recent was the Elliot Norton Award for the Best Actress and Outstanding Production for Who's Afraid of Virginia Woolf? And, The Boston Symphony Orchestra is still playing for audiences more than 129 years later? Other impressionable places to explore include Shubert Theater, Wang Theater, Calderwood Pavilion, and Wilbur Theater. Emerson College hosts many shows at the Cutler Majestic Theater throughout the year. With all of the places to explore in and around Boston, it is no wonder that the city has hit the list of Best Places for Millennials to live. The city center is thriving with a fun day scene and diverse nightlife. Cultural exhibits, shows, and venues offer locals the chance to explore the history of Boston. With so many sports teams, any resident can cheer on a favorite or spend time visiting all the stadiums. One thing is clear, Boston is not a dull place to live. Whether you are looking for a high end Back Bay Brownstone for sale or a quite home in Cohasset, the greater Boston area does not disappoint.